The bear coat is a recessive gene, meaning it will only produce visual bear-coat dogs if both the sire and dam carry the gene, and even then the chances are statistically 1-in-4. The odds increase to 1-in-2 if one of the parents is a bear coat, and 1-in-1 if both parents are bear coats. The gene is a throw-back to when Shar-Peis were on the verge of extinction, and the few remaining specimens had to be cross-bred with other closely-related breeds in order for their survival. This explains why even now there is quite a diversity in the appearance of Shar-Pei dogs. The thick and long bear coat appears to be a trait carried through from the Chow Chow, and is still relatively rare to find. 1. Rarity value. Shar-Peis are still a relatively unusual breed, but bear coat Shar-Peis are extremely rare. This means that anyone who particularly wants a rare dog (that is not an anomaly) couldn't do much better than a bear coat Shar-Pei. 2. Things change. You don't have to go back very far to a time when only a few Shar-Pei coat colours were accepted by the KCOGB. Now of course there are dozens, all of which have been produced (and reproduced) in sufficient quantities for the KCOGB to accept them as standard. Lilac, as shown in these photos, is a very good example of this. As the bear coat becomes more and more popular (and it is), there will undoubtedly be a time when the bear coat becomes recognised by the KCOGB. 3. The best reason of all. Quite simply, bear coat Shar-Pei are adorable! As well as appearing adorable, they have excellent temperaments - very calm, friendly and affectionate. This makes them ideal as a family pet, and ideal for anyone who wants a really affectionate, really unusual, really adorable dog! And with a real chance of them being recognised as a standard by the KCOGB in the future, they're ideal for anyone who wants an almost unique dog with genuine show-winning potential. 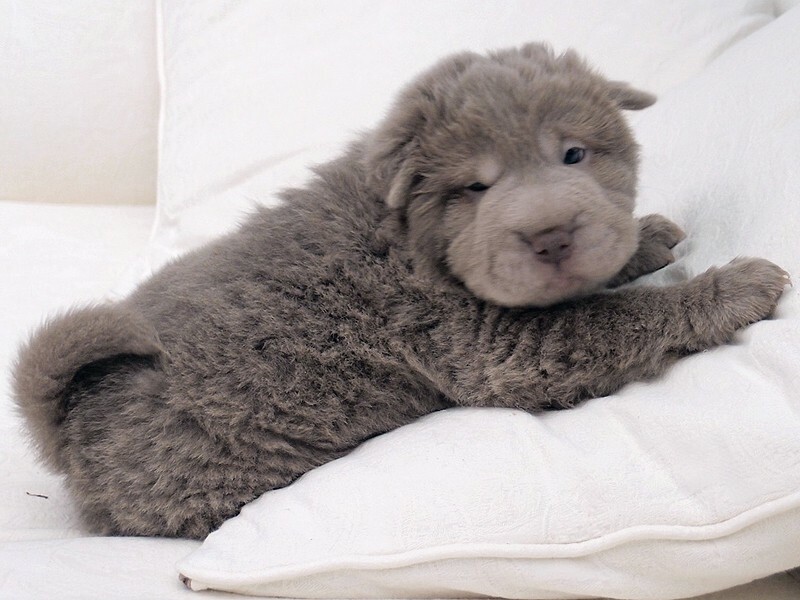 If you want a Shar-Pei that you definitely will want to show, then until the KCOGB add bear coats to their standard for Shar-Peis, these adorable and very rare dogs aren't for you. Also, if you don't want people coming up to you constantly when you take your dog out for a walk, then bear coats are not for you. Otherwise, the only reason you shouldn't consider them is if you just don't like them (I can't imagine how anyone wouldn't though).